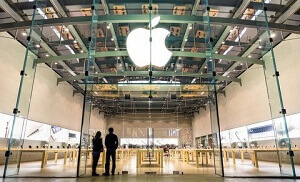 Why Is the AAPL Stock Price Falling Today? Subject: Why Is the AAPL Stock Price Falling Today? 2 + 3 = Required Please enter the correct value. 4:24 p.m. update: AAPL stock closed Thursday at $96.45, down 4.22% on the session. A rocky market and anxiety over iPhone sales have lopped 5% off the AAPL stock price this week, pushing shares below $100. Shares of Apple Inc. (Nasdaq: AAPL) last dipped below $100 on Aug. 24 and haven't closed below $100 since Oct. 20, 2014. After shedding 2% yesterday (Wednesday), the Apple stock price was trading early today (Thursday) at about $98.50, down another 2%. Apple stock is down 6% in 2016 so far, and is down more than 26.5% from the 52-week high of $134.54 reached in April. The AAPL stock price has been falling since early November, when worries about iPhone sales started. Several Apple suppliers have issued lower guidance and earnings warnings over the past two months, with each report adding to the concern that the iPhone 6s and iPhone 6s Plus models introduced in September are not selling as well as last year's models. This week the story got more fuel when the Japanese newspaper Nikkei reported that iPhone factories in China planned on cutting production by 30% in the January to March period. Worries of weak iPhone sales in the December quarter have now bled into worries of a weak March quarter. "Massive production cuts speaks to what looks to be a soft March forecast on the horizon as 6s sales have been less than stellar out of the gates," FBR Capital Markets analyst Daniel Ives told USA Today. Wall Street focuses intently on sales of the iPhone because it's responsible for about two-thirds of Apple's revenue. Exactly how bad iPhone sales are won't become clear until Jan. 26, when Apple reports earnings. The earnings date means nearly three more weeks of negative speculation, which is bound to drag the AAPL stock price down further. Adding to the pressure on the Apple stock price right now is the turmoil in the overall market. The Standard & Poor's 500 Index is down 5% over the past month, with most of the decline coming in the past week. Concerns over weakness in China – one of the reasons stocks are lower – is also a problem for Apple shares. Over the past couple of years, China has become Apple's primary growth market. It all adds up to more short-term pain for the AAPL stock price. A technical analysis by Rich Ross of Evercore ISI suggests an Apple stock price drop to at least $90, and possibly as low as $72. If AAPL stock falls that far, its price/earnings ratio would sink below 8, making it a screaming buy. Apple's P/E is under 11 now, much lower than the S&P 500 average of 20.75. And yet the long-term prospects for the AAPL stock price remain strong. The iPhone 7 due in the fall will be a major upgrade, as was the iPhone 6 in 2014. That is expected to revive sales. It's also worth remembering that Apple has a history of enduring setbacks and then rebounding. And despite his call for a decline in Apple shares, Ross is optimistic about the company's future. "All is not lost in the stock here. The bigger trend remains higher in the long term. But with a new product not scheduled to be released until September, and the chart showing some real wear, I would be wary of Apple here," Ross told CNBC. So investors who already own Apple stock should probably hang on for now. But those looking to buy shares could get an incredible bargain, particularly if the AAPL stock price dips below $90. The average one-year price target on AAPL stock is still $148 – even after more than half a dozen analysts have cut their targets over the past month. If the Apple stock price dips into the $70s as Ross suspects, savvy investors could jump in and set themselves up to double their money.